In my email last Tuesday was a list of eight books that I had been assigned to “skim” before our next One Book One Lincoln selection committee meeting on March 27. Luckily for me, I had read one of them last winter so I have only seven serious books to read in two weeks. I don’t skim. 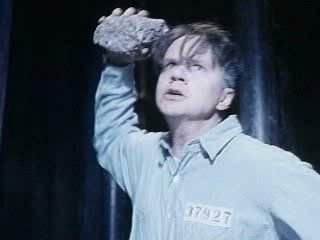 On a related matter, one of my favorite movies was on last night so we watched The Shawshank Redemption. It bothers me that as a long-time Christian I am so hooked on revenge themes. Curiously, The Count of Monte Cristo is referenced in Shawshank Redemption and it’s a novel that I’ve read multiple times, savoring Edmond Dantès’ delicious retaliation against those who betrayed him. I try to believe that God has given me a sense of justice and it’s not the suffering of the perpetrators but the vindication of the offended that moves me. So far, I’ve read 100 pages of the story Emmanuel Jal tells about being one of the “Lost Boys” of Sudan. Horrible things are happening in our world. Human beings can be despicable to other human beings. Atrocities, which I choose to not relate, occurred in our very recent past. So far, I’ve read 100 pages of the story Slavomir Rawicz tells about being a Polish prisoner of the Soviets and being sentenced to 25 years hard labor in Siberia – to which he was force-marched the last 800 miles in deep snow. He also was treated wickedly by other people as recently as the mid-20th century. The morning paper carried a story today about the parents of Ty Smalley from Perkins, Oklahoma. The Smalleys are telling the story of their 11-year-old son, a victim of school bullying, who took his life. Wow, I find it scary that children can be so cruel as to drive their classmate to suicide. Again, how can someone do that to another person? Furthermore, how do children get a notion to do it at such a tender age? I’m a bit overwhelmed by the profound examples of our human condition and some people’s willingness to race to the bottom when it comes to inappropriate behavior. I’m thankful that I have been spared such experiences in my lifetime. I don’t bully and except for the bowling alley incident in 7th grade haven’t been on the receiving end. I despise it. I don’t understand it. I’m rarely there when cruelty happens, but if ever I am, I pledge to somehow make it stop.